The Pico Paddle (PP) is definitely the smallest series production paddle in the world - although this miniature precise paddle is very small in its dimensions and lightweight, it is an absolutely full-fledged dual lever paddle! 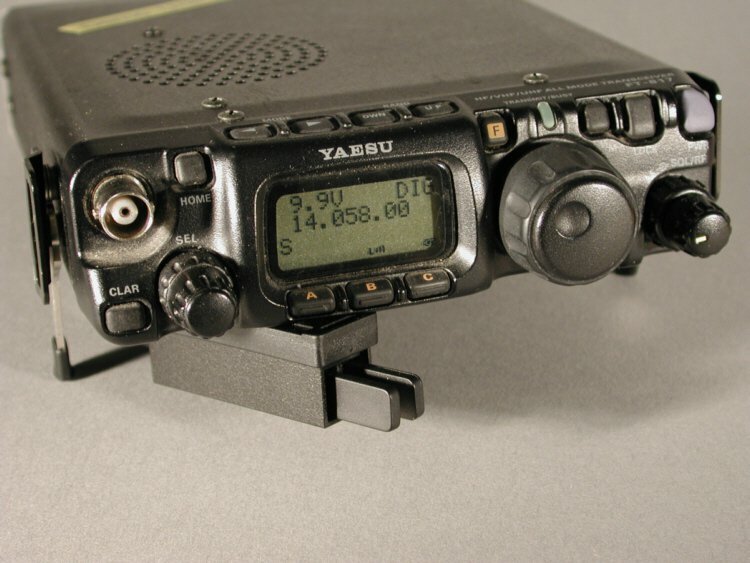 The aim of the design was to develop a fully functional miniature paddle, which is ideal to attach to various popular HF transceivers (eg, KX3, FT-817, FT-857). For this purpose, device-specific installation kits can be used (Mounting Kit MK-KX3/Mounting Kit MK-817). During development it was essential to us to ensure that the quality of this subminiature paddle can absolutely compete with its bigger brother, the Mini Paddle! Of course, also the Pico Paddle - "typically Palm Radio" - can be retracted into the housing and is perfectly protected during transport. It also uses high-quality, galvanically gold-plated contacts. The adjustments for contact spacing and spring tension are optimally adjustable to the needs of the user in the established manner, using hex screws. Supplied with the Pico Paddle is the quick mounting PP QuickMount (PP-QM), and easy accessible Allen key, which allows easy and precise adjustment of the hex screws. 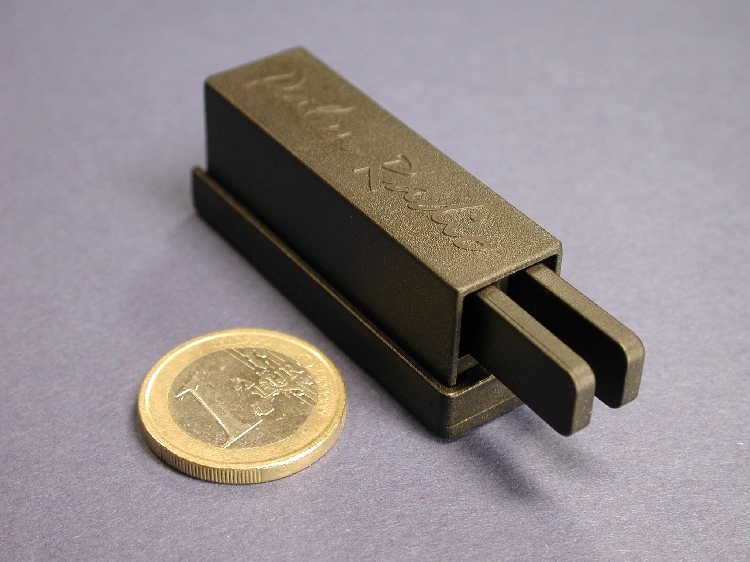 The included PP QuickMount (PP-QM) is equipped with powerful neodymium magnets, so that the Pico Paddle can be easily and securely attached to all of ferromagnetic surfaces (e.g. directly to the transceiver). 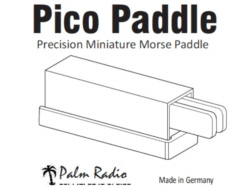 The Pico Paddle has a 2.5mm stereo jack at the back side. The supplied cable has a length of about 18" and is very thin and flexible - the other end contains a 3.5 mm (1/8 inch) plug for connection to the transceiver or keyer. Cable wiring is standard, i.e. left to tip. Optional cable with tip and ring reversed (left to ring) is available. A robust Travel Case is included and makes it easy to accomodate the Pico Paddle and the other included accessories, e.g. the PP QuickMount for universal mounting, a connection cable with 3.5 mm (1/8inch) plug and the user manual. Paddle can be retracted into the housing and is thus optimally protected during transport. Rigid square cross-section housing.for maximum versatility and protection. Case size only 15x15x50 mm or 0,6x0,6x2 inch (WxHxD) - the smallest series production paddle in the world! Weight only 14 grams - complete with PP QuickMount (PP-QM) complete only 27,3 grams. Two separate adjustment screws per side allow individual adjustment of spring tension and contact gap. Firmly seated with no vertical play in the paddles. Gold-plated contacts ensure long life and reliability. Travel Case, Connection cable with 3.5 mm jack plug, PP Magnetic QuickMount (PP-QMM) with integrated Allen key and instructions included. Especially suited for the Pico Paddle , we offer an inexpensive mounting solution, the »Pico Plate«. It is a plastic plate with metal inlays and two self-adhesive sticker pads. After adhesion of the Pico Plates, the Pico Paddle is attached with its magnetic Pico Paddle QuickMount (PP-QMM). 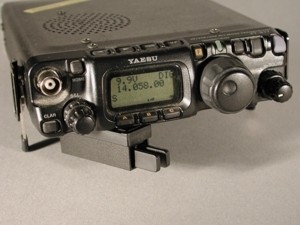 The Pico Plate can be mounted directly to the transceiver and remain there. This looks very elegant and unobtrusive, especially on radios like the KX1 or KX3. Another advantage: The Pico Paddle can easily be attached and removed from the rig. The Pico Plate can of course also be glued on other surfaces (such as station table, radio, dash or a heavy base plate). The Pico Paddle is attached vertically in this case. Ideal and easy solution for mounting the Mini Paddle or Pico Paddle on the right side of the KX3: The original side panel (aluminum) of the KX3 is simply replaced with »Side Panel SP-KX3«, made from black powder coated steel. It is dimensionally 100% compatible with the KX3 and allows easy installation of the Palm Paddles by their magnetic Quick Mounts on the right side of the KX3. Device and paddle thus form a compact unit. Manufacturing the side plate is quite expensive: The laser cut side panels are first milled (rounded edges! ), manually deburred and then completely nickel plated. In the next step, the pads are covered to keep them free of powder at the following powder coating process - thus a perfect contacting to the ground of the KX3 is being assured. 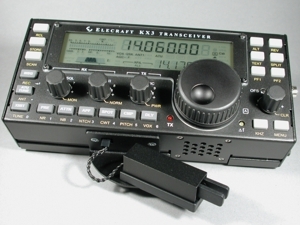 The MK-KX3 can be used with the KX2 also. However, there is a difference in the angle of the bracket when the feet are expanded. The angle in the case of the KX2 is approximately 72 degrees and in the case of the KX3 it is approximately 65 degrees. The result is that the Pico Paddle on an MK-KX3 mount, when attached to a KX2, will not be parallel to the operating surface and the paddle will be angled up toward the user. If you want to make the paddle parallel to the table, you can add an 11mm (approximately 1/2") spacer underneath the rear foot of the KX22. If you are a user of the Palm Pico Paddle, your comments could be here! Write to us via the link below, and please be sure to say specifically that we can use your comments on the web page.